I’ve been struggling to get my illustration and design website rebranded and redesigned via a fairly uncooperative WordPress platform. I’ll be adding more work to it later in the month as I complete a couple of new client projects and portfolio pieces via my work at SVA. I’m excited for that, but disgruntled every time I look at other designers’ and artists’ portfolios, and walk away convincing myself of how much better their stuff is than mine. While I’ve been selling my fine art on Etsy for several years and have been doing custom commissions since the 5th grade essentially, I still suffer from what I dub the “newbie blues”. And I use the term “newbie” almost ironically here, since I’ve been producing art for the better part of 3 decades. But my tenure in the professional world of branding, design and commercial art is much shorter than that, naturally. And even with 25 years of consistent validation from family, friends and colleagues that my work is worthwhile and “good”, none of that validation means much when it doesn’t come from myself. This is a common thing that you experience when you start a business as well. One of the first concerns, no matter where you’re coming from, is “What if people don’t take me seriously because I’m just starting out?” Newsflash: every business started somewhere, with someone, pondering over some new idea. Everyone was “just starting out” at some point in their entrepreneurial career. It’s a normal, and completely acceptable, part of the process. While it wouldn’t be uncommon for you to carry concerns and insecurities with you at any phase of your career or business, since we’re in a constant state of evolving and growth, the end goal here is confidence in the value you provide. It will take some trial and error, seeing the results of those first few satisfied clients, or financial gains, to get you on board with thinking, “Okay, maybe I really am doing something right here, and people get that.” What will that measurement of confidence be for you? It’s likely you pursued the professional path that you did based on what you know to be your best talents, skills, strengths, or even creative ideas that you want to develop. You looked at these intangible assets and saw a way to both bring value to a particular audience in need, and also monetize that ability to produce a solution or opportunity. True confidence in your work comes from understanding the direct value and impact you provide to your audience, whether it’s your customer, client or the organization you work for, and having a good sense of how to best communicate what that value is that you have to offer. This is especially important in the job interview process as a job seeker, and critical to the marketing process as a small business. That value is what gives strength, sustainability and potential to your brand. The way I’m feeling right now about my creative portfolio is exactly how I felt about my business when I was starting out as a career consultant. It’s also exactly how I felt when I introduced the small business consulting vertical into my brand offerings. At some point, each of these endeavors was new to me, and it didn’t matter how much prior experience I had – the act of offering it to my own audience was still new. And I struggled with feeling confident around not only my ability to convince people that I knew what I was doing, but that I could deliver on my promises. I know that I’m capable, but it was more of an issue of not having prior successes to compare it to. Even though I knew more than most normal people want to know about small businesses, how could I be certain that I would be an effective teacher when I hadn’t previously worked one on one with anyone as a case study? That quickly changed as I put myself out there and took on my first clients. Same thing when I started out writing resumes, and the same was true when I stepped up and started running the entire operations for the Boston office of Digital People at 22. What did I learn? Confidence in your abilities to deliver true quality and value comes from experience, and experience comes from getting over your fears and hesitations and just jumping in and doing it, starting somewhere. This is one of the worst things you do when you’re starting out in something – looking around at all of the models of success, and tallying up all the ways in which you seem inferior. Of course you’re going to lack certain qualities, accomplishments and experience compared to someone who has been doing something longer than you have. I mean, if we all stepped out of the womb as fully developed teenagers, well that would just be an uncomfortable and unnatural situation for everyone. It’s the same idea, and part of the solution is to simply embrace the natural progression of the process and let it unfold organically as you learn, experience and evolve. I’m a complete hypocrite on this one, because I was woefully comparing myself to far more senior illustrators about 12 hours ago. But what enlightened me to the negativity of my thinking was understanding that my style is completely different from this person, and trying to emulate both their style and their success will get me nowhere. I have a style that I know is appealing to my own audience, and as I continue to refine that style, my work increases in quality and becomes more valuable. For instance, I don’t understand Mark Rothko‘s work one bit, and it’s one of those things where you really wonder what the hell is so compelling about a couple of colored rectangles stacked atop one another that apparently is so emotionally compelling that it makes people weep. But that doesn’t change the fact that his work, and his style, have a clearly defined value to someone…several million dollars worth. So is it worth comparing and trying to understand the secret of his appeal? Nope. Because my clients have no interest, or budget, for that. 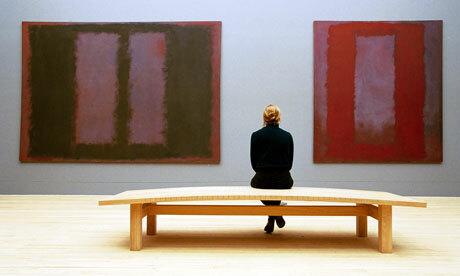 And like everyone else, Rothko too struggled to find his way, as the majority of his work revolved around his ongoing quest to explore the human psyche. Even the most highly-regarded trail blazers in their fields start from a place of lack – lack of understanding, lack of direction, lack of confidence, and then set out to understand the true value of their work, and reposition their brand as one of innovation and credibility. And when we’re all starting from the same launch pad, well think about the infinite space which that opens up for us to create our story and producing work and ideas that we’re truly proud to call our own. 3 Comments on "Battling the Newbie Blues: Finding Confidence Through a Lack of Experience"
Just so you know I think your website is great! It gets to a point where you have to concern yourself less with your own branding and image and do the best work for your clients, and focus on what’s working right now. BUT, i guess you see your own website as your best piece of work because that’s what you offer? I get wrapped up in how my website looks (it’s weak), but as long as those who look at it get the right info (services/ portfolio) then it’s working. Also, in my case, my clients are not necessarily web heavy. If anything they want to see a single PDF or pitch that lets them know in 3 minutes how I can help them.